Limburg an der Lahn (pop. 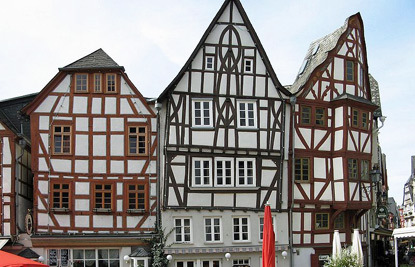 34,000) is a well-preserved historic town of the Lahn Valley, renonwed for its timber-framed architecture. 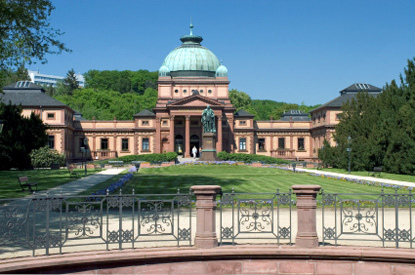 It is the capital of the district Limburg-Weilburg. The town of Limburg developed around the castle of the same name, originally built in the 7th century. 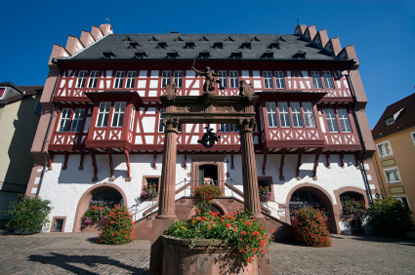 It was first mentioned as "Lintpurc" in 910, when the St. George monastery was founded by Konrad Kurzbold. 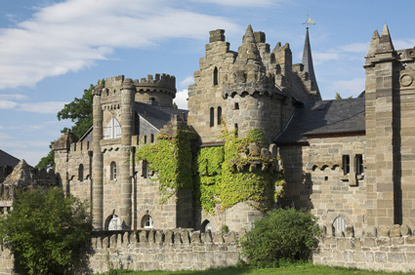 The name probably derives from "Linter Burg", i.e. "castle on the Lint River". It was located on the Via publica (a.k.a. Höhenstraße), going from Cologne to Austria via Frankfurt, Würzburg, Nuremberg, Regensburg and Passau. The town acquired stone ramparts in the 12th, 13th and 14th centuries. The construction of a new church belonging to St. George monastry started around 1200. Around the same time, a new castle was erected south of the new church. Limburg received a charter granting it city status in 1214. 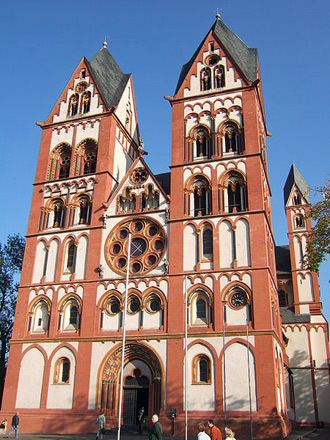 Soon after, in 1235, the new St George Church was completed and consecrated by the Archbishop of Trier. 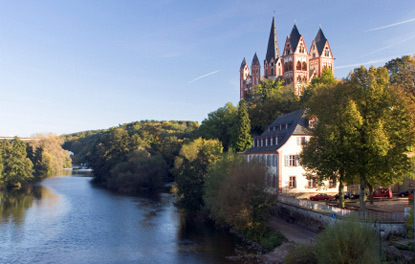 St. George's Cathedral and the Lahn River. The plague ravaged Limburg in 1344. 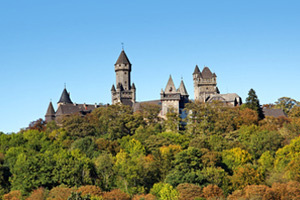 The town then underwent a steady decline until the early 19th century, when the rise of the the Duchy of Nassau (1806-1866) gave a new lease of life to Limburg, which lied at the very centre of the duchy. In 1827, Limbug became the seat of a diocese. In 1862, it had become an important railway junction in the region, and in 1886 it was made district capital. Werner-Senger-Haus (13th-century facade), at Rütsche 5. Haus der sieben Laster (House of the Seven Deadly Sins, built in 1567), at Brückengasse 9. Haus Trombetta, at Frankfurter Straße 2. Houses on the Fischmarkt, at numbers 1, 9, 12, and 16/17. 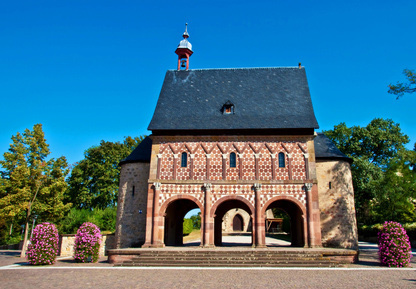 The St. George Cathedral (Limburger Dom) is one of the best example of late Romanesque architecture in Hesse. Built between 1200 and 1235, it was elevated to the rank of cathedral in 1827. 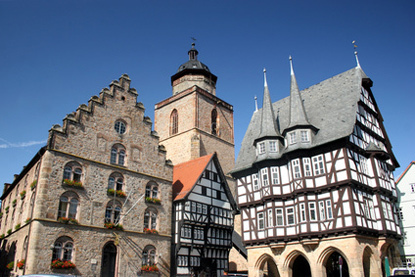 Its twin-tower facade is typical of the Rhineland region. The cathedral appeared on the back side of the 1,000 Deutsche Mark banknotes (the largest denomination) in circulation between 1960 and 1989 (a period coinciding with West Germany's post-war "economic miracle"). 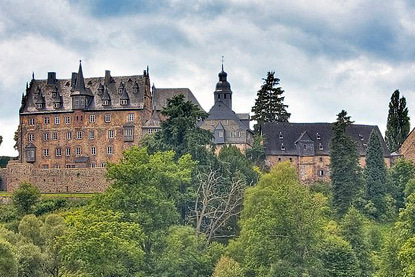 South of the cathedral is the Castle of Limburg (Limburger Schloss ), built at the beginning of the 13th century by Gerlach von Ysenburg. It should not be confused with the Walderdorffer Hof (at Fahrgasse 5), the former residence of the Counts of Walderdorff. The Alte Lahnbrücke (old Lahn bridge) dates from 1315, making it one of the oldest bridge in Hesse. It was an important crossing point on the Via Publica (see History). 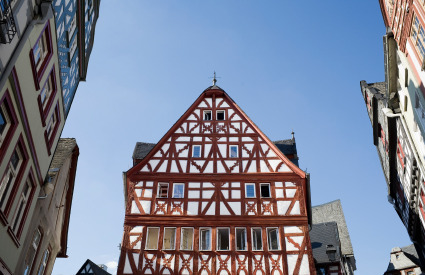 The narrowest passage of this long historical trade route was in Limburg an der Lahn, to be precise in front of the house located at Kleine Rütsche 4. 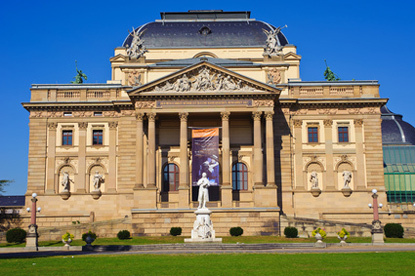 The Diocese Museum & Treasury is housed in the Staurothek. Tow other noteworthy churches are the St. Annakirche (14th to 17th century) and the Stadtkirche (13th and 18th century). Of the original city wall only remain the rounded, 13th-century Katzenturm ("Cats Tower"). 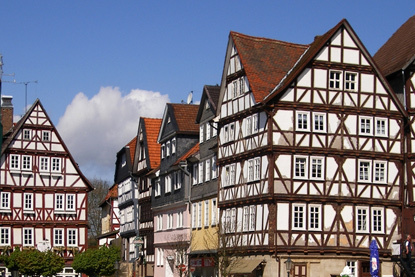 Limburg an der Lahn is located on the E35 (A3) motorway, about halfway between Bonn and Frankfurt-am-Main. Coming from Koblenz or Trier, take the E44 (A1/A48) towards Frankfurt-am-Main. It will merge with the E35 (A3) 10km outside Koblenz. Take exit 42 or 43 for Limburg. The ICE (bullet train) station is Limburg Süd, 1.5 km east of the historical centre. 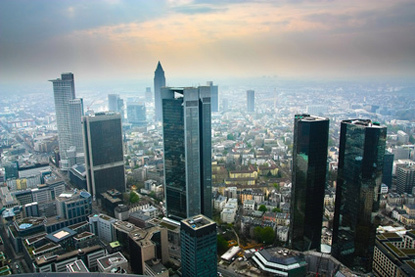 It has frequent high-speed trains from/to Frankfurt-am-Main (35min), Cologne (50min), Düsseldorf (1h20min), Aachen (1h20min), Liège (2h10min) and Brussels (3h). There are buses to the historical centre from the station. Limburg (Lahn) Station, just south of the historical centre, only has regular trains to nearby destinations, including Koblenz (55min), Wiesbaden (65min), and Frankfurt-am-Main (65min).